Fruit is extremely expensive in Japan. While in Belgium fruit is priced by the kilo or the bag, in Japan the price usually applies to one single piece of fruit. These apples for instance, cost 198 yen a piece (about 2 euro)! One thing I do have to admit is that fruit in Japan is of the highest quality. So at least you can take some comfort in the fact that you’re getting your money’s worth. This entry was posted in Food, Japan and tagged Belgium, Food and drinks, Fruit, Impressions of daily life, Prices by Haruko-chan. Bookmark the permalink. Yes the fruits costs a lot here in Japan! The expensive walter melon (like Fuji crown melon for example) costs 20000yen(around 200 euro) for a piece!!!! 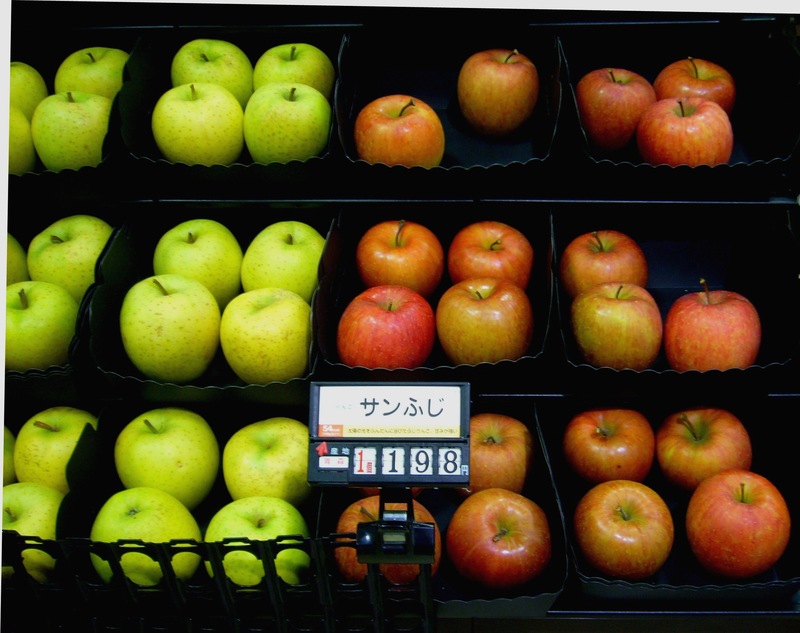 Oh my god, I had no idea there was fruit that is sooo expensive in Japan! Incredible! I’ve never tasted strawberries as good as the ones they have here in Japan!